Long time no post! 2013 got busy and productive, and I might have forgotten my username for a while. 🙂 I traveled to new places, saw new things, tried new things, had a blast, and am now welcoming 2014 with open arms. Last year had it’s ups and downs and now I’m ready to set some high goals and do my best to achieve them. One of the things I’m trying out is to work my way through my hundreds and hundreds of Pinterest posts. I love my Pinterest. I might be on it too much, but it’s a great one stop shop to research tons of ideas, learn new things, and become inspired. I figured instead of just collecting tons of fun looking pins, that I should start working my way through them. 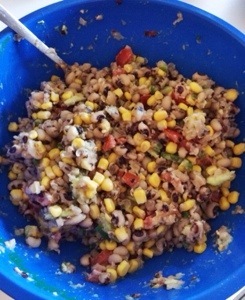 First pin I tackled this year was a Black Eyed Pea Dip. It was easy, a little time consuming, fresh tasting, and delicious. 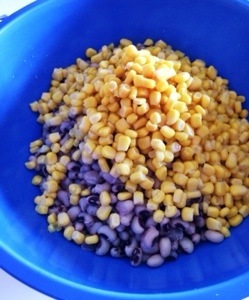 It was time consuming due to my decision of cooking the black eyed peas myself. Everything else was super quick. I didn’t follow the recipe to the letter. I always alter as I go. I left out the onions due to an intense dislike on my part, and the oil to save on calories. All in all, this was a promising start to something I hope to continue all year. Lol yes ma’am! I am going to do my best to keep at it. I adore Pinterest. Sometimes I feel like I’m indulging so I’ll look up a different topic that I deem productive such as work related pins. There’s something so satisfying about Pinterest. It’s digital hoarding at it’s finest. Best of all, it’s free! Thanks! I’m glad I’m jumping back in.